Shellness, Isle of Sheppey. With Ben Oakley. 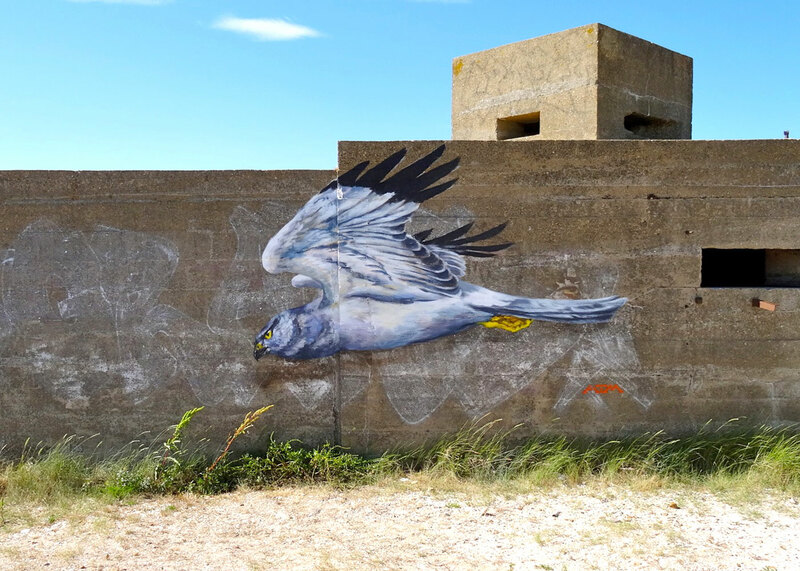 The concrete block on which this hen harrier is painted is isolated on the shoreline, with just a track leading to it through marsh and meadows, with shingle, sand and sea on the other side. The air is full of the calls of oystercatchers, redshanks and curlews. The painting can be seen from passing boats. Hen harriers migrate over this very spoton their way to their nesting grounds on the moorlands of Northern England, where most of them are shot by gamekeepers preserving the interests of the grouse shooting industry.